Whether it’s autonomous cars, summer storm supercells or understanding what really happens to your data when it’s saved to the cloud, Discover’s “Everything Worth Knowing” special issue now available on newsstands offers essential insight into many of the pressing science questions of the day — as well as other compelling topics to inform and delight readers. Why does music have the power to move us? Why are humans born to run? What could possibly be good about mass extinctions? Discover’s editors and writers answer these and many more questions in more than a dozen special stories covering astronomy, archaeology, psychology and everything in between. “There’s never been a greater hunger for fact-based science journalism,” says Becky Lang, Executive Editor of Kalmbach Media’s Science Group. “Our Everything Worth Knowing issue satisfies that hunger, providing readers with great stories that are timely, informative and entertaining. This issue will definitely stimulate your family’s brain throughout the summer months.” Lang, who has been a Discover editor since 2013, also served as health and science editor at the Milwaukee Journal Sentinel and was part of the editing team that won a 2011 Pulitzer Prize for Explanatory Reporting. She, along with Discover’s expert team, is available to provide commentary and context on all manner of science news and inquiry, particularly health and medicine. 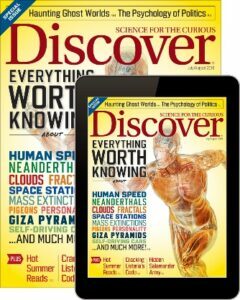 Discover’s “Everything Worth Knowing” is on newsstands now, and is also available through Kalmbach’s My Science Shop.